Hi, I'm Paul Miles. I have over twenty years of experience in the music business, both as performer and a music producer. I've been a touring and recording artist with various signed bands in the 90s, with releases on such labels as Beggar's Banquet, Cherry Red and Universal. 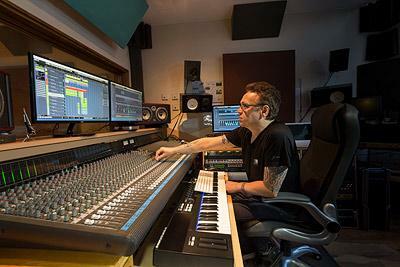 During this time, I developed a passion for recording, song writing and music production and soon after this, Select Studios was born, originally in Kentish Town and more recently moving to Wood Green, north London. In addition to recording and production expertise, I'm also a songwriter, mix engineer, and musician playing guitar, bass, keyboards and drums. I have a friendly and down-to-earth style of producing and always make artists feel welcome and comfortable immediately. This helps artists to relax and create their best work and ideas. I have been told that my enthusiasm is genuinely catching and with my skill, encouragement and experience I am able to help artists take their songs to the next level with quality equipment and production ideas. I take on board directions and ideas as well as guiding and providing advice on style and technique. In the past I have worked with both established and new artists. I'm familiar with a wide variety of genres from hip-hop, RnB, pop, dance, rock, dub step, electro, indie, metal, country, jazz.